Ghostbusters is the movie I wish came out when I was kid because I know 10-year-old me would adore it. The nerdy premise teamed with a great group of kickass funny ladies makes for pure entertainment. Lucky for the new Paul Feig film, 27-year-old me also enjoyed this fun reboot of a popular 80s franchise. Something strange in the neighborhood brings four New York City women together to capture ghosts and save the city from destruction. Kristen Wiig and Melissa McCarthy star as scientists and paranormal enthusiasts Erin and Abby, who were childhood friends until Erin gave up their paranormal research for academia. They are reunited when a ghost turns up at an old Manhattan mansion. Along with Abby’s friend and nuclear engineer Jillian (Kate McKinnon), they head to the supposedly haunted mansion to find out what they believed to be true all this time: ghosts are real. Teaming up with MTA worker, Patty (Leslie Jones), who also had a scary ghost encounter, our new ghost busting team has arrived and is ready to take down the ghouls – and all the non-believers. It would be negligent on my part to not admit that there is an incredibly meta aspect to this Ghostbusters remake. Ever since the project was announced, fans of the 80s classic have strongly voiced their opinions – most inappropriate, little valid. The movie knows this and has fun with it. Add that with all the winks to the original, and it’s easy to find the self-awareness a little tiresome. When taking everything else about the film into account, like how genuinely funny and badass it is and the wonderful camaraderie between the actresses, there is so much here that makes this film stand on its own. But the frequent nods to the past are rather easy to overlook because this movie is a ton of fun. While Wiig and McCarthy are always great, this is a true showcase for new talents Kate McKinnon and Leslie Jones, who easily earn the biggest laughs. McKinnon’s Jillian has a stand-out action scene that truthfully I’m dying to watch over and over again. While Jones has pitch perfect comedic timing and is the most relatable character of the new team. Sort of – and I mean sort of – rounding out their group is Kevin, played by the insanely handsome Chris Hemsworth, the Ghostbusters’ not-too-bright but charming receptionist. It’s a funny twist on the gender roles usually assigned in cinema and leads to an even funnier third act (and end credits sequence). With a summer full of lackluster blockbusters, Ghostbusters was a much-needed surprise. Full of laughs, heart, action and some smooth dance moves, it’s a worthy return to a beloved franchise. There’s no question here on who you’re gonna call. 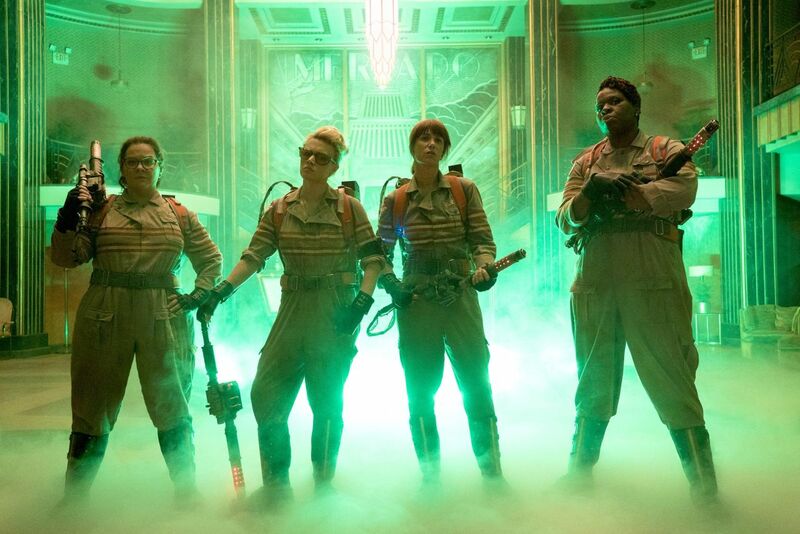 Ghostbusters arrives in theaters on Friday, July 15.